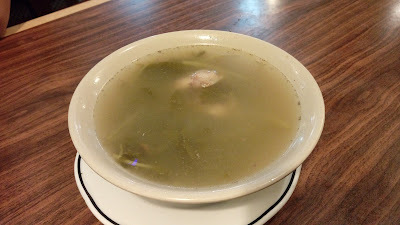 The soup of the day was Watercress and Pork Bone Soup 西洋菜煲豬骨. There's a good visible amount of watercress in the bowl with chunks of bone meat. The pork bone broth was savory, but MSG was also quite noticeable. 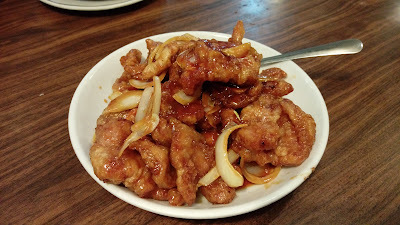 First to arrive was the Crispy Chicken Topped with Ginger & Green Onion 脆皮油淋雞. 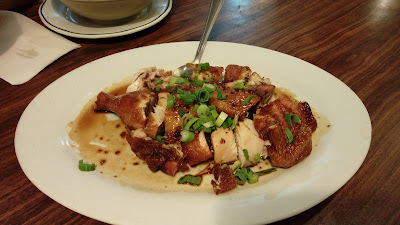 The chicken was fried to crispy then dressed with a blend of soy sauce, sesame oil, sugar, ginger and scallions. This place knows how to do chicken right. Not only the dark meat was delightful, the white meat was also moist and delicate. We polished this plate of half bird pretty quickly. The main reason why Buddha Boy loves this divey restaurant (and made it our canteen) was for its Prawns with Scrambled Egg 滑蛋蝦球. 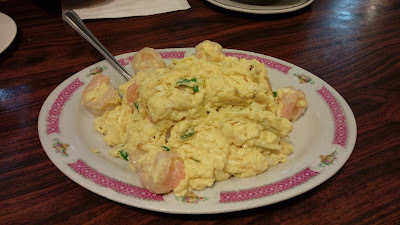 As always, the mildly seasoned eggs were creamy, smooth and fluffy. The prawns were pretty decent in quality with that gentle textural crunch. From the photo. it didn't seem like there were a lot of prawns, but there were a number of pieces hiding beneath that bed of scrambled eggs. We wanted something meaty and a simple staple such as Pork Chops with Sweet & Sour Sauce 京都肉扒 satisfied our need. Unlike The Soup House 湯.com where the sauce used primarily ketchup, the flavoring blend here used mainly sugar and vinegar with a gentle and quiet tone of ketchup. The delectable chops were savory and succulent. This was an appetizing dish. We had three dinner specials packed as take-out for delivery at my dad's place. 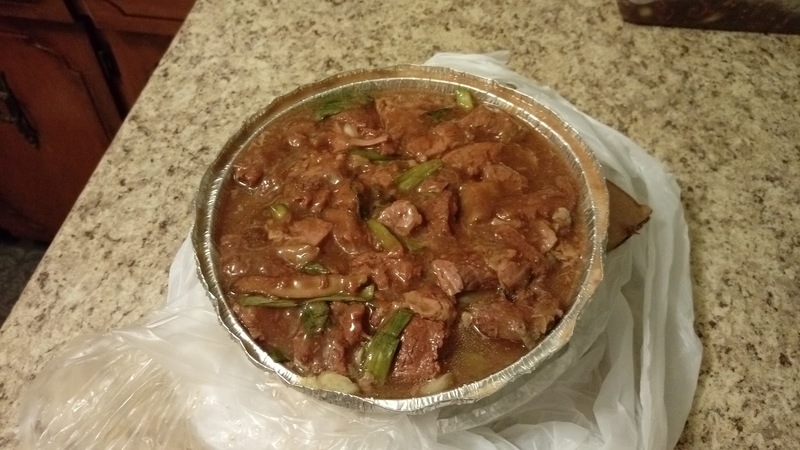 The first plate was Beef Brisket Hot Pot 原汁牛腩煲. 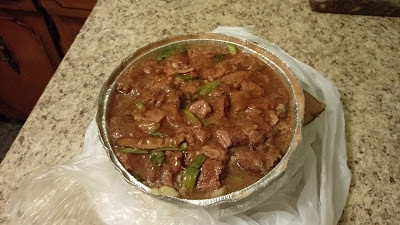 The second to-go dish was Shredded Beef Tenderloin with Black Pepper Sauce 黑椒牛柳絲. 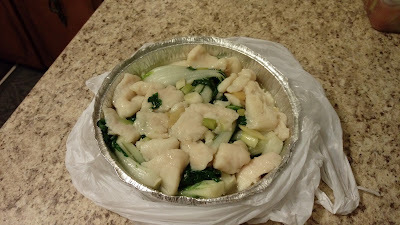 The third container was Sauteed Cod Fillets with Greens 時菜斑球. 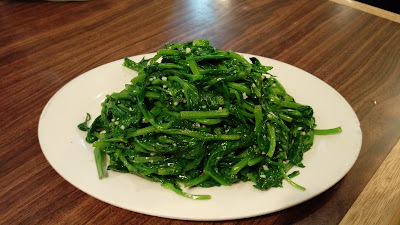 Off the regular menu, we ordered Pea Sprout with Garlic 蒜蓉豆苗. The vegetables were fresh, young and tender. Considerable amounts of fresh chopped garlic accented the greens with a solid garlic aroma. 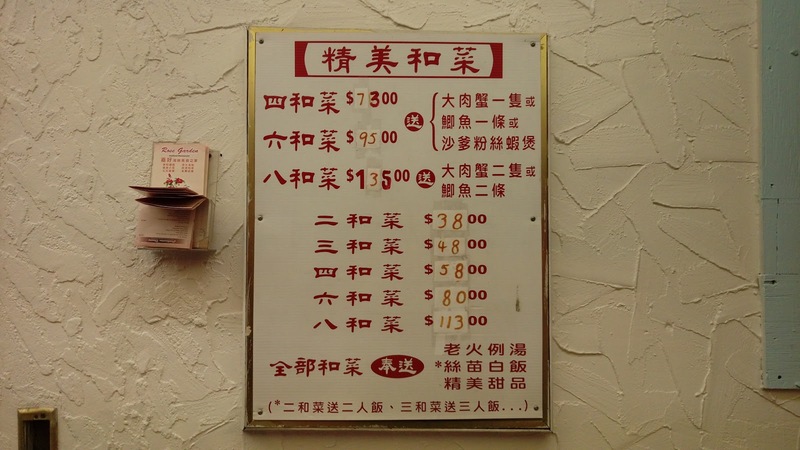 At Rose Garden Seafood Restaurant 嘉好海鮮美食之家, the Family Combo 精美和菜 comes in two types of pricing. 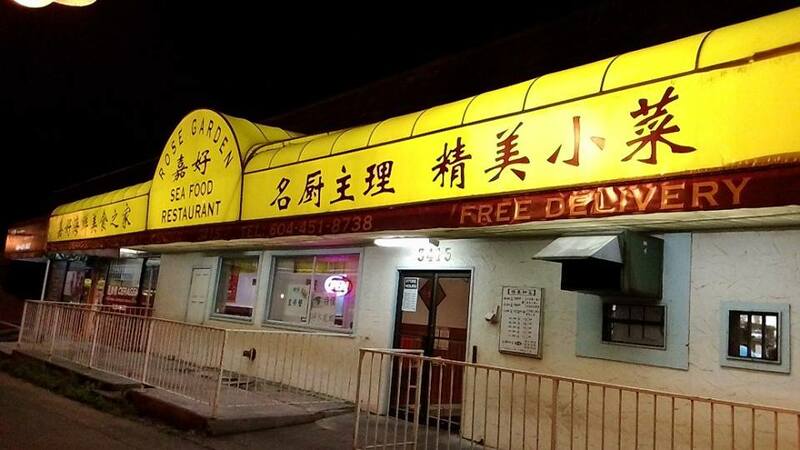 If you order four/six/eight items from the combo dinner menu, you have the option of "paying" a little more for the so-called "free" dish (crab, tilapia or prawn satay pot) Yes, it's not actually "free" as stated on the menu, instead, you are getting an extra dish at a discounted price. No paid freebies if you order three items or less. 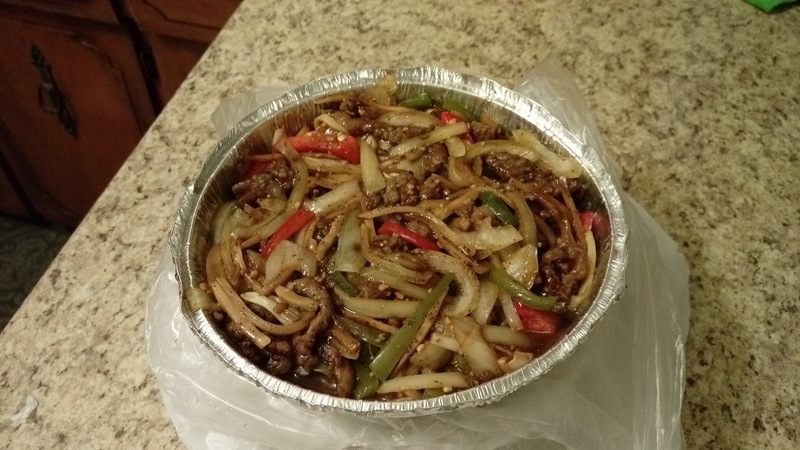 All combo deals include soup of the day, white rice and dessert of the day. As I have mentioned before, this scroungy old-school Chinese restaurant located on Kingsway near Tyne Street in Vancouver is our neighborhood canteen. Portions are admirable. Prices are reasonable. Quality is respectable. Taste is agreeable. While all the servers are friendly and welcoming, service can be questionable.